주목할 만한 일이 또 있었는데, (RAAM 완주자이기도 한) 김기중님의 뒷드레일러가 부산으로 가는 도중 고장났습니다. 김기중님은 "자가제작 싱글 바이크"로 문제를 해결하고 부산까지 달렸습니다. 그리고는 한밤 중에 자전거를 고쳐줄 샵을 겨우겨우 찾아내서 토요일 아침에야 다시 길 위를 달릴 수 있었습니다. 완주하신 분들 모두 축하드립니다. 완주자 명단: 최병희, 후쿠시마 타이키, 햄 제이슨, 헤닉하우즌 로타, 정영화, 김기중, 김민수, 김성학, 김영삼, 이규원. SBS는 한국 란도너스의 2012년 마지막 대회였습니다. 2013년 시즌에는 부산과 천안, 광주에서 또 다른 라이딩이 있을 예정이고 전라도와 근처 시도를 달리는 1200K도 있습니다. 기대하세요! road side coffee machine to warm up). 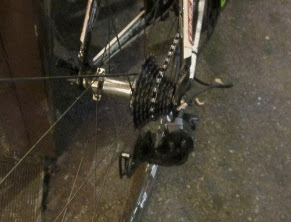 Noteworthy, Kim Ki-joong's (RAAM finisher) rear shifter broke on the way to Busan. He bypassed the problem, and rode with the "self made Single Speed" to Busan, where he arrived Saturday before midnight. He managed to find a bike shop that was willing to fix his bike in the night and he was back on the road on Sunday morning. Congratulations to all finishers: Choi Byung-hee, Fukushima Taiki, Ham Jason, Hennighausen Lothar, Jeong Young-hwa, Kim Ki-joong, Kim Min-soo, Kim Sung-hak, Kim Young-sam, Lee Kyu-won. SBS was the last 2012 event of Korea Randonneurs. The 2013 season will bring exciting new rides out of Busan, Cheonan and Gwangju, including a 1200K in Jeolla and neighboring provinces - stay tuned!